Finally, Combine the Power of Giveaways and List Building to Explode Your Email List Of Hungry and High Converting Buyers… Using Three Simple and Easy to Implement Strategies… Starting Today! This video training course will show you step by step how to set up a giveaway that produces a high converting list. This specific video will introduce you to the system by getting you into the right mindset to guide you in the right direction. You’ll be given a quick overview of the video series as a whole, given a list of tools you need to get started, and shown how the system will work. By knowing this, it’ll allow you to zoom forward and implement the giveaway event quickly and easily. This specific giveaway strategy covers building high converting freebie lists. While I stated earlier that buyers lists are way better than freebie lists, if done right this specific strategy will help you build more responsive list faster than ever by ensuring the traffic that comes to you is of high quality. This giveaway strategy only requires a small group of list owners to participate and can be setup easily. You’ll be given the mind map to how this works and how to implement this strategy with ease. In this specific video, you’ll learn how to build a buyer’s list by organizing giveaways that consist of a group of list owners joining together to bundle their products together. This type of giveaway is a little old school, but can still work if done a certain way. We’ve tweaked the model to ensure that it still converts, because if done incorrectly, it can actually create a negative impact which includes overwhelming your buyers, diluting the responsive of buyers towards other list owners’ participants, and more. This video will contain a mind map so you can learn how the process works as well as step by step, over the shoulder instructions on how to implement it. In this specific video, you’ll learn how to build a buyer’s list through a more advanced strategy, which is the big fish of this video course. The only downside with giveaways is that they tend to be a one off, meaning they are done during a certain time limit. This strategy creates a giveaway that is consistent and ongoing. The advantage is that it generates buyers on a consistent basis and is a win-win situation for all list and product owners involved in the giveaway. This does really well because youre building a list of buyers faster than ever and you dont have to do anything after the initial implementation. This video will include a mind map as well as the process of implementation. Video #5 :: Stuck? Dont have a list? In this specific video, you’ll learn how to find list owners to participate in your giveaways. The key is not to just choose anyone, but to choose the right list owners in the same niche. Do this wrong and you will set yourself up for failure. Now the question is how do you get the list owners to jump on board? You won’t be able to get everyone to jump on board, so don’t be discouraged. It is what it is and if you get rejected, then move on. But in this specific video, I’ll help you by showing you how to increase those “Yes’s” by helping to create a win-win situation for all participants. 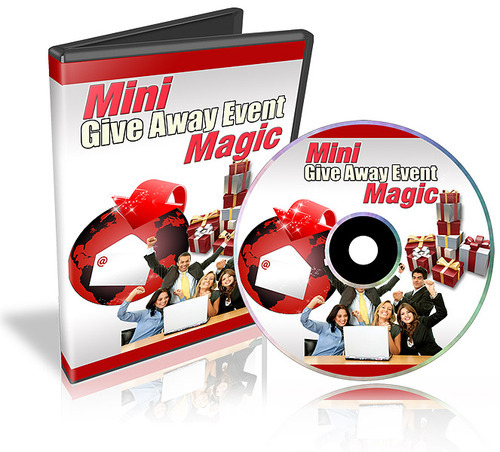 Mini Give Away Magic (with Resell Rights) mini giveaway magic 242333489 30.97 resellrightsvideos Fresh Download Available!